Jan 5th 2012 = big fat positive!! I was pregnant, for the 3rd time. We had planned a baby 5 years earlier following a successful vasectomy reversal, but when nothing happened; we gave up hope and carried on with our lives. So this was great news, but a MASSIVE shock! Behind our initial excitement was the nagging fear of hyperemesis gravidarum. You see, this is why the vasectomy was carried out in the first place. I'd had HG with my 2nd child, a girl, and was so poorly with vomiting and nausea that we swore never again, and the vasectomy was carried out when she was only 4 months old. But despite the trauma of the pregnancy, memories do fade, so when she hit 5 and started school, I was broody once again. When I told my mom about the 3rd pregnancy, she freaked at me. Sounds harsh, but she was the one who had tirelessly supported me through my 2nd HG pregnancy and she hadn't forgotten! But this time it would be OK, right?? I mean, my first pregnancy (a boy) had been plain sailing, trouble free... So this one could be the same, couldn't it? It was probably another boy, and I'm fine carrying boys, so no need to worry, right?? I was just over 4 weeks pregnant when I found out. I felt good! No nausea, no vomiting, I was ok! I started to take a little more exercise (only walking) as I was overweight and wanted to try and shape up a little before the pregnancy developed. Jan 13th was my daughters birthday. We went for a huge carvery to celebrate, and I polished it off with a delicious pudding. I was doing great! Then one afternoon I was sitting round my relatives house watching the chiropodist do his feet, when a wave of nausea swept over my body. I had to leave the room to avoid vomiting, but despite moving away, the nausea remained. By 6 weeks pregnant, the constant nausea had kicked in. I made an appointment to see my GP immediately to request some medication. I explained my previous experience of hyperemesis, and the GP reluctantly prescribed some metoclopramide. I went away hoping this was the answer, but a few dosages later, I realised that it wasn't going to work. HG was back, with a vengeance! I tried to persevere at home with fluids and light food, but after 2 weeks, I was seriously weak and dehydrated. I went to the GP who admitted me to hospital for treatment with IV fluids and anti-emetics. My ketones were very high and I'd already lost 11lb. In hospital they gave me approx 5 litres of fluid. This helped a little but the symptoms didn't go completely. I was sent home on oral medication but only lasted 4 days before I was admitted once again. This time it took 7 litres of fluid before I could even pee. My body was completely dry! Once again I was sent home on cyclizine and stemetil. This time my mum intervened. She had watched me lying on the sofa, drowsy and wretching for longer than she could stand until eventually she started forcing me to drink. She filled bottle after bottle of water and coaxed me until I had swallowed it. Sometimes I'd argue and cry, but she never gave up! Despite the fluids, I was becoming weaker and weaker. I had lost another 11lb and could barely stand. I made visit after visit to my GP to beg for help, but each time I was told there was nothing that could be done. I was told to imagine a car battery. The baby was taking all of the energy from the battery until it was left flickering! That was me! By approx 10 weeks I felt I could take no more. I was sleeping throughout the day and for 12 hours at night. Every waking moment was endless torture with overwhelming nausea and vomiting. If I moved, I was sick! This baby was slowly killing me, sapping every last shred of energy from my body until I was lifeless. I had to end the pregnancy! I climbed into bed and cried myself to sleep. The following morning I got up to use the toilet, only to discover that I was bleeding. It was all my fault! I had wanted the pregnancy to end, and now it had. This was judgement on me. The ultimate punishment! I rang the Dr's first thing to arrange to see my GP. He advised that I was probably going to miscarry and booked an emergency scan for that afternoon. That day was so tense and painful. I cried out of guilt, anger and self pity. After all of the suffering, I was losing my baby. When the scan time arrived I hesitantly made my way into the room while fighting back the tears. I held my breath when the probe rolled over my stomach and I feared the worst..... But my baby was still there! Still fighting, still alive, and with a strong heartbeat! Relief washed over me, and despite still feeling utterly wretched, I swore never to have thoughts like that again. I would have this baby even if it killed me! The next few weeks continued in much the same way...lying on the sofa all day every day, wretching into a vomit bowl. Too weak to stand, too frail to even go to the bathroom. At 12 weeks and 4 days I had my dating scan. All was good with baby but I was still very ill. I saw my consultants understudy for review and I told him about my crippling sickness. I requested ondansetron which he reluctantly prescribed. I also expressed my concern about my long periods of immobility combined with dehydration. As a nurse, I was all too aware of the risks of deep vein thrombosis in circumstances like mine. I was told that I didn't meet the criteria for blood thinners. 3 days later, I awoke from a daytime nap to a pain in the right side of my chest. It was mild, but it was there! It hurt when I breathed. I was frightened! I had a pre-booked Dr's appointment that afternoon to check up on my sickness. Stupidly, I didn't mention it! I'd spent so much time complaining of sickness (with little help) that I felt I'd be branded a hypochondriac if I mentioned this problem too. Anyway, it would go off soon, wouldn't it?? But it didn't! It stayed with me until bedtime. I climbed into bed, but I was in real discomfort, and I couldn't lie on my left side at all. Something was very wrong! After a restless night, I woke the next day admitting that I needed help. I took a bath (knowing I'd end up in hospital) and called the Dr.
After speaking to the on call Dr, I was eventually (after persuasion on my part) offered an appointment. My hubby drove me to the clinic, and once inside I explained to the Dr about the pregnancy, HG and subsequent weakness and dehydration. He told me I was a moderate risk for a Pulmonary Embolism (life-threatening clot on the lung), but as it was Saturday afternoon, the A&E dept would be busy, so probably best I go home and rest, and go to the hospital if I became worse! Although I knew this was a wrong call, I dutifully did as I was told and went home. When I arrived, my mum was really unhappy with the Drs decision, and she made me go to A&E despite what the Dr had advised. How glad I am that I have a caring family, because the hospital diagnosed multiple clots (3 on the right lung and 1 on the left). I was lucky to be alive! I spent the next week in hospital having various tests and treatment for the clots. The chest pain became so severe I needed intravenous morphine, and I started coughing up blood. I was started on blood thinning injections which I would need to take until the baby was 6 weeks old. From week 13-20 the nausea and vomiting remained severe. I was tolerating fluids better, but still had major problems eating. At least I managed to stay out of hospital, but was still on a concoction of anti-sickness medication. I had to see my consultant weekly for blood tests and checks on the baby. By 20 weeks, I was improving. I still had nausea, and required medication, but I guess I had what you would call 'normal' morning sickness by then. I went for my 20 weeks scan. All was well with the baby, but I had a low placenta. I was told not to worry as it would almost definitely move as the pregnancy progressed. I was rebooked for a scan at 31 weeks. From 20-31 weeks the pregnancy was fairly uneventful. I still had nausea, but manageable, and I continued the medication. I still saw the consultant weekly. At 31 weeks I attended my repeat scan - and guess what....the placenta hadn't moved, and I would need a section. The consultant booked me in for 38 weeks, and I was referred to an anaesthetist as I was advised I couldn't have a spinal block while on blood thinners. I would have to be put to sleep! What the hell was going on?? surely I was entitled to a straightforward birth after the hell I had endured??? bad pregnancy = good birth, right??? WRONG AGAIN! The consultant advised that, although a caesarean section was my safest option, the fact that I was on blood thinners, and the placenta lay on the incision line, I was in for a major bleed! Worst case scenario....a hysterectomy or death! I spent the next few weeks in a bewildered daze. I cried every single day to my family because I was so scared. Everyone I met insisted how excited I must be to have an exact date when my baby would arrive, but I had no excitement, just overwhelming fear. I felt no bond towards the baby, I didn't even know if I wanted him any more. The morning of my section arrived - 31st August 2012 - A day I would remember forever. The anaesthetist came to see me, and advised that I could have a spinal block after all. I told him no. I had mentally prepared myself to be asleep, and I couldn't handle a spinal block. Not now! Turns out I knew what was right for me. When the consultant made the incision into my placenta, I suffered a catastrophic haemorrhage, and lost half my total blood volume in 3 mins. Thankfully I had an incredible team on standby who saved mine and my baby's life. I had an amazing baby boy weighing 7lb 9oz. He was PERFECT!! Unfortunately for me, it wasn't over. I was taken to HDU because of the volume of blood I lost, and while there had a further haemorrhage. I needed manual removal of clots which was done with gas & air. The pain was incredible. I had drips, drains and infusions everywhere, but it was all over. I had done it! I had beat HG!! A long period of recovery followed. I needed more blood transfusions, and further problems with bleeding meant another hospital admission when the baby was 2 weeks old. Then just when I thought it was all over, I was rushed into hospital 3 weeks later with a strangulated hernia requiring emergency surgery. I still don't know what caused this. It could have been pressure from the pregnancy, or it could have been the vomiting. I have never been given an explanation. 8 months on, I feel physically quite well. My baby John James is amazing, and I love him with all my heart, but mentally I am scarred by HG and its consequences. 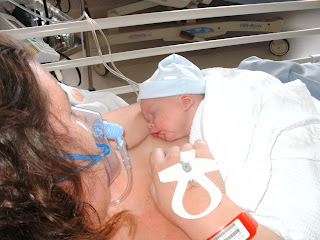 It robbed me of a healthy pregnancy and spoilt those first precious weeks with my boy. Many things remind me of those desperate early weeks....smells, TV programmes, music, hospital visits....I will never get over the pain and trauma I endured. But I'm alive and well, and enjoying being a new mum again. I will be returning to work as a staff nurse in the next few weeks at my local hospital, and when I feel strong enough, I plan to approach my consultant and ask if we can work together to improve care for ladies with HG.